SAINT-QUENTIN-EN-YVELINES, France — Europe will take a 5-3 lead into Day 2 of the Ryder Cup after sensationally dominating the afternoon foursomes on Friday. After winning only one of the fourball contests in the morning, Thomas Bjorn’s men seized the initiative as their opponents struggled badly in the alternate-shot format. Omnisport’s Ryder Cup roundup brings you all the key details from Le Golf National. In the opening match of the event, Rose holed a stunning pitch on the 12th to secure a 2 up lead in the company of Rahm. However, Koepka and Finau came storming back to win and received a huge stroke of luck at 16, when the latter’s tee shot bounced toward the pin off a wooden post lining the lake. Europe did not need anything spectacular in the afternoon as its opponent fell apart, but the most remarkable moment came when Garcia and Noren hit the turn 7 up against Mickelson and DeChambeau. 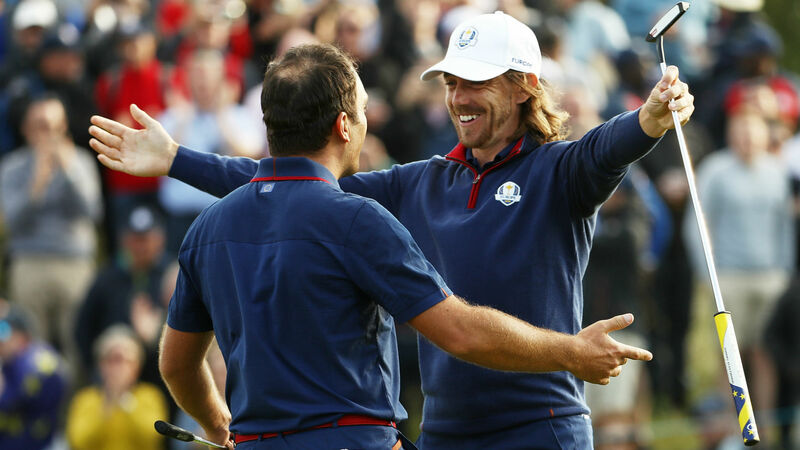 Fleetwood and Molinari claimed a vital point against Reed and Woods in the morning, finishing strongly to ensure Europe avoided starting a second successive Ryder Cup with a 4-0 session loss. The affable duo then thumped another high-profile US pairing, Spieth and Thomas, to crown a superb day’s work. For Fleetwood, it was quite the introduction to the Ryder Cup on his son’s first birthday. All four U.S. groups failed to deliver in the foursomes, recording a combined score of 10 over par. Let’s try this again. There were 60 holes played in the afternoon session. The U.S. led for six of them. McIlroy was the only player not to make a birdie in the fourball contests, but the Northern Irishman turned things around in the company of Poulter. “The Americans have pretty much handed it to them. To have eight players play this poorly, you can’t expect to win.” — Sky Sports pundit and highly regarded coach Butch Harmon bemoans the U.S. foursomes performance. “To see all the blue on the board this afternoon is awesome.” — Rory McIlroy delights in the dramatic turnaround. “I didn’t hit a bad shot today.” — DeChambeau comes up with a surprising line after he and Mickelson were thrashed by Garcia and Noren.